Don't you dare finger count the months until October. 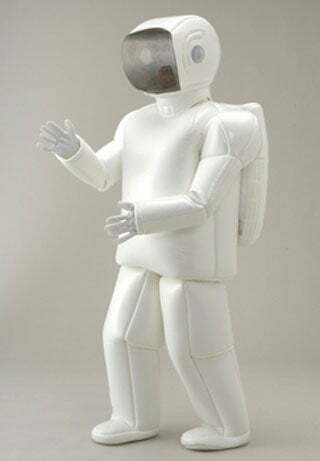 This Asimo suit is a completely necessary tool in confronting life's persistent social challenges. Let's say you're meeting someone on a blind date. She promises to be wearing a yellow rose so you can spot her easily in the line at the Cinnabon. But what if she lied about being a 22-year-old Hawaiian Tropic bikini model who's never suffered a single follicle of crotchal razor burn? Or worse yet, what if she learns that you aren't really a robot? The Asimo suit offers an inconspicuous means of scouting ahead. In the case that your female friend is one stubble away from her description, she'll never see your face as you sneak behind the counter, peek around the warm glaze and realize she's grotesquely only somewhat above average in looks. In the case that she is the lady of your dreams, the suit will provide a few months of wiggle room before you fess up to misleading the poor young woman and offer to set her up with your refrigerator.